Seton Hall appears to be ready to take this whole competition defeating some of the best throughout the season. Tonight they face Markus Howard and the Marquette Golden Eagles. Myles Powell made Big East history, and he looks to lead the Pirates to a win. Myles Powell had a quiet first half, but he came out the 2nd half on fire; Scoring back to back treys and a mid-jumper, giving the Pirates 2-point lead. Sam Hauser was blazing, knocking down 4 of 6 from 3 point territory and leading the Golden Eagles with 16 points. 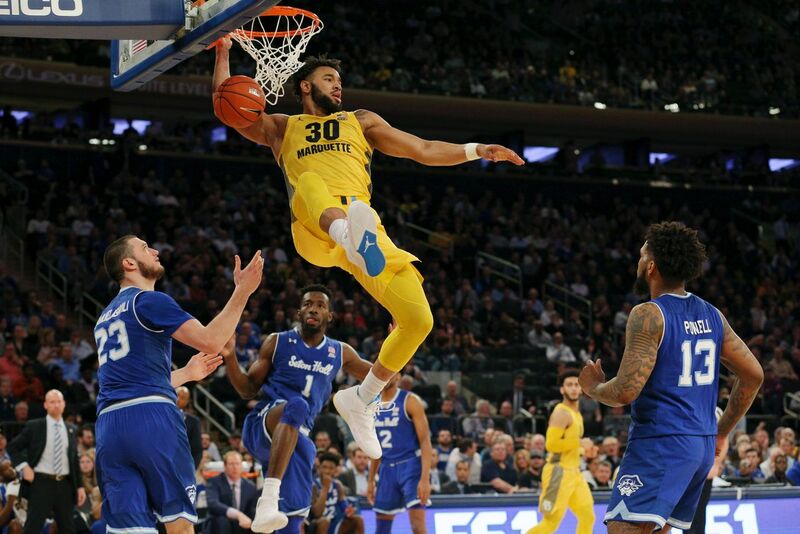 The game began to get chippy as an altercation broke after Marquette forward Theo John pushed Myles Powell to the ground as he was on his way to the basket. In a result Marquette’s Theo John, Sacar Anim were ejected, and Seton Hall’s Sandro Mamukelashvili was also ejected. Seton Hall would have to stay calm and un-rattled if they would remain in the game; and calm and collected was what Myles Powell did. Knocking down jumpers and treys, he stayed poised giving the Pirates a 1 point lead. The game was down to the wire; with 1:14 on the clock Seton Hall led by 6 points (78-72). Markus Howard steps to the line for 3 shots, and to our surprise missed the first two shots. After a string of foul calls, and insane officiating, Marquette finds themselves within 2, (81-79) Markus Howard takes a step back 3 for the win, it bounces off the rim and as the shot clock expires the Seton Hall Pirates win the game. They defeat the Marquette Golden Eagles 81-79, and advance to the Finals to face off against the reigning champs Villanova. Next Story → Villanova Makes Big East History! !